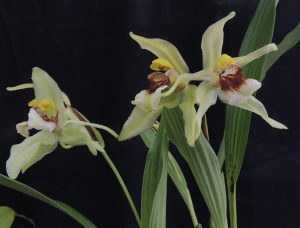 This large flowered Coelogyne is native to Papua New Guinea where it is reported in montane forests from 100 to 2000m which suggests it can thrive in a wide range of temperatures. We find that plants do best in our Cool Asia section (min 10C) where plants flower profusely from the developing new growths in early summer. 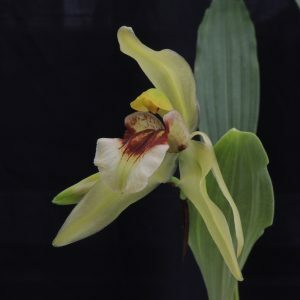 Some related species are sequential with their flowering while this species produces 2-4 flowers per spike with all the flowers opening together and giving a great display. We find that plants enjoy really heavy watering as the growths develop over the summer. I missed reading about this beautiful orchid this morning! What a beautiful flower it has. How is it pollinated? By a large bumble bee.